Road work is scheduled next week on several local streets as part of the Township's annual Road Maintenance Program. The township’s annual Road Maintenance Program is progressing rapidly, with portions of several local streets scheduled to be milled and paved in the coming week. Work is scheduled to begin on our about Monday, July 25, on Queen Anne Road from Country Club Drive to the terminus, and on Tampa Ave. from Jackson Road to Valley Run Drive. The project includes a mill and overlay of the road surface, as well as isolated removal and replacement of sidewalk where trip hazards exist. Work will also continue next week on King George Road, Preston Road, Surrey Road, Oak Avenue, Evergreen Avenue, St. James Place, Hialeah Drive and Belmont Avenue. In total, more than 55 local streets are scheduled for work as part of this year’s road program, a significant investment in our town’s infrastructure by my administration that will make our roads smoother, safer and easier to navigate, while preserving the quality of neighborhoods throughout Cherry Hill. All work is weather-permitting. Contact the Department of Engineering at (856) 424-3203 for questions or concerns about any local road project. Click here to learn more about our Road Maintenance Program. Tennis courts at Cherry Hill West, Beck Middle School are currently closed for improvements. The tennis courts at Beck Middle School and Cherry Hill West/Locustwood Park are currently closed to the public for continued improvements. The courts at Beck are closed for resurfacing, while the facility at Cherry Hill West is closed to allow for final surfacing and painting, the final step in the total renovation of those five courts. 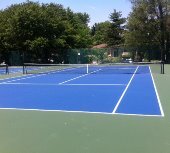 Additionally, the tennis courts at Cherry Hill East are closed for cleaning, color coating and re-striping. The facilities are expected to open by late summer; in the interim, residents looking for public tennis facilities can find a list at www.CherryHill-NJ.com. These improvements are part of my administration's ongoing effort to improve public recreation facilities throughout Cherry Hill. Other ongoing projects include the construction of new multi-use turf fields at Cherry Hill High Schools East and West, the installation of a new Pickleball Court at Lion's Den Park, hockey and tennis court improvements in various locations, new athletic fields at Croft Farm, handicap-accessibility upgrades to several Township trails, improvements to Cherry Valley, Ashland and Springbrook parks, new path paving at Erlton North Park, Still Park, Ashland Park and Columbia Lake, and continued preservation and restoration of the outbuildings at historic Croft Farm. Together with Council, we remain committed to investing in recreation, open space and infrastructure, to ensure Cherry Hill remains a vibrant, thriving, quality community in which to live, work and raise a family. Mayor Cahn met with students from Cherry Hill High School West's summer program on Monday, July 18. My administration and the Cherry Hill Police Department welcomed rising seniors from Cherry Hill High School West summer program to Town Hall on Monday morning to learn about our local government and the history of our town. Students met myself and Cherry Hill Police officers and asked many great questions before taking a tour of the municipal building and police headquarters. Thank you to the students to giving us their time and attention, and for their very thoughtful and lively participation! We wish them great success in their senior year and future endeavors. Join the Cherry Hill Police Department on Aug. 2 for National Night Out. The Cherry Hill Police Department invites all residents to join Chief Monaghan, Township Police Officers, Mayor Cahn and members of Township Council for National Night Out, 6-8 p.m. Tuesday, Aug. 2, at the Cherry Hill Municipal Complex on Mercer St. National Night Out is an annual community policing event held the first Tuesday of August to strengthen ties between the police and the community. Admission is FREE for this fun-filled evening, with a variety of events and activities planned throughout the event. A special thank you to our sponsors Cherry Hill Dodge Chrysler Jeep Ram and Kennedy Health, as well as the many vendors who are participating, including The Famous King of Pizza, Chick-fil-A of Cherry Hill, Philly Pretzel Factory, Cherry's Ice Cream & Water Ice, Target and Classic Cake. Find a full list of events and activities on the Cherry Hill Police Facebook page. Come visit with members of your police department, and help us by becoming a partner in community policing! For more information, call (856) 488-7868 or email Events@CHTownship.com or Alliance@CHTownship.com. When the temperatures and humidity rise, it is important to limit your time outdoors, stay hydrated, and remember to check on neighbors who may need assistance - particularly the elderly and individuals with limited mobility. Senior citizens, children and pets are especially vulnerable in extreme temperatures. Click here for more information to help you beat the heat and stay healthy this summer. 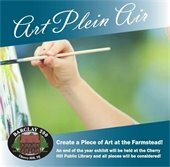 As part of our ongoing celebration of historic Barclay Farmstead's bicentennial year, artists of all ages and levels of interest and experience are invited to take part in our ongoing Art Plein Air effort! Come visit the farmstead, enjoy the beautiful historic grounds, and create art of any kind. The gardens and surrounding property are especially beautiful this time of year. All art will be eligible for inclusion in a special Barclay 200 exhibit planned at the Cherry Hill Public Library at the end of this year; stay tuned for details and submission guidelines in the coming weeks! To learn more about historic Barclay Farmstead or the Barclay200 celebration, be sure to follow Cherry Hill Recreation and the Barclay Farmstead Museum on Facebook! The summer is a popular time for vacations, and criminals are aware of this. Cherry Hill Police want to remind you that a house or apartment left empty while its owners are traveling is a tempting target. And while police don't want to scare you -- or leave you fearing for your belongings while basking on the beach -- but it's imperative that every traveler take certain key steps to keep his or her home safe and sound while seeing the world. Basic and simple preventative measures (which take only minutes to complete) can work wonders to help you avoid things like power surges or potential home invasions and ensure that when you return from vacation, you are not returning as a victim. Click here for nine steps to take prior to vacation to help keep your home safe. Beatlemania Again had the crowd on its feet and dancing at this week's Music Under the Stars. We had another great evening of Music Under the Stars, as residents were able to "Come Together" to enjoy the sounds of Beatlemania Again! The Township's free, family-friendly summer concert series will continue this week with the Sensational Soul Cruisers, and every Tuesday in July, with a different opening act and exciting headliner who's sure to keep you up and on your feet! Great food will be available for purchase. Bring your blanket, a chair, and even a picnic dinner - just don't forget your appetite for great music! Every Tuesday evening will feature a different musical adventure at the historic Farmstead. Thanks to this year's sponsors from Republic Bank, Camden County College and MD Anderson Cancer Center at Cooper, these concerts are FREE and open to the public. We'll see you next week! Come experience the mind and body benefits that only yoga can provide. Join Cherry Hill Recreation and Lourdes Health System for the final class in their four-week free Yoga in the Park series at Croft Farm next Saturday, July 30. This beginner-level class is open to all, and yoga is a wonderful activity for those with diabetes, high blood pressure, high cholesterol and heart disease, and helps everyone to build strength, flexibility and mind/body awareness. Class will be held from 8 - 9 a.m.. Please bring your own mat and water. For more information click here. Registration in advance is required. You can also contact the Cherry Hill Department of Recreation at Recreation@CHTownship.com or call (856) 488-7868. Dozens of families have enjoyed our weekly Pop-up Storytimes in local parks! Get the kids ready and head on over to one of our local park on Fridays in July and August for a special outdoor Pop-up Story Time, brought to you by Cherry Hill Recreation and the Cherry Hill Public Library! More than 50 people turned out this Friday morning for our inaugural storytime, hosted at Ashland Park. The program will continue each week through Aug. 12, with stories and fun with CHPL’s Librarians. Story time runs from 10 to 10:30 a.m.; visit Erlton on July 29; Kresson Woods/Haddontowne on Aug. 5; and Old Orchard on Aug. 12, weather permitting. Click here for photos. For more information, visit www.chplnj.org. Fifteen restaurants are on board for Cherry Hill Restaurant Week 2016, which returns with a week of specials from Aug. 7-14. For one week, participating restaurants will offer patrons a special prix-fixe ($25 or $35) 3-course menu, with lunch options available in most locations, as well. This is an exciting opportunity to promote local businesses, while giving our residents a chance to enjoy a special meal at a great price. Look for more information, including a list of participating restaurants, sample menus, and updates to the Cherry Hill Restaurant Week website, Facebook page and Twitter account (@CHRestaurantWk) in the coming weeks. And be sure to save up your appetite for the week of Aug. 7! The Cherry Hill Recreation Department invites you to the first-ever Al Fresco Affair at Croft Farm, from 6-9 p.m. Thursday, Aug. 4. An evening under the stars and twinkling lights will set the mood as you enjoy some of the finest food trucks in the area. There will be dancing and music, as well as lawn games for the kids. We hope to see you! For more details about this and other events provided by Cherry Hill Township, like Cherry Hill Recreation on Facebook. While you are there, search for the Facebook event - Al Fresco Affair. The need is constant. The gratification is instant. If you are in good health, at least 17 years old and weigh at least 110 pounds, now is the time to roll up your sleeve and donate. Every type can save a life! Click here to make an appointment online. Walk-ins also welcome! Can't make it to our story times during the day? Join us select evenings for some of the great stories, rhymes and songs, from our Summer Stories. Best for ages 2-6. No registration. Having fun and being playful is an important nutrient to a successful, healthy and well-rounded adult life. Play keeps our stress levels down and our happiness quotient up. However, with today's busy lifestyles, it's easy to get sidelined. Join Adventure Coach, Patt Osborne for this upbeat workshop to rediscover the benefits of play and reignite your own playful plans. Attendees will enjoy thought-provoking activities and discussion. Click here to register. Daunted by the thought of writing your college essay? Confused about which topic to choose? If you're a rising senior and unsure of where to begin your personal statement, you're not alone. Join us for a writing workshop with teacher and educational planner Sandra Clifton, who will provide winning recommendations and expert suggestions on how to get started. Click here to register. Did you know Cherry Hill residents 55 and older are eligible to receive special pricing and discounts to certain programs and events through the Township's Gold Card Program? Gold Card members can receive discounted concert tickets, free admission to high school performances, and discounts provided by participating local businesses. To enroll in the program, visit the Department of Recreation, Room 102 of the Township Municipal Building, with proof of residency. In addition to these special pricing options, your Gold Card will also entitle you to free food at the Township's upcoming Senior Festival on Monday, Sept. 26, at Town Hall. To learn more about these programs, or any other issue of interest to Cherry Hill seniors, please contact our Senior Services Program Coordinator, Gaye Pino, directly at gpino@chtownship.com or (856) 661-4800.